The best part of holidays for me is ... the food. It's so enjoyable to share a wonderful meal with friends and/or family, and this year for Easter we're going traditional with a spiral ham, deviled eggs, honeyed carrots, rolls, and at least one more fresh veggie. We'll see what's at the store tomorrow. Preheat the oven to 350ºF (180ºC, Gas Mark 4). Butter and lightly flour two 8-inch round cake pans. Cream the butter or shortening and slowly add the two sugars, beating until light and fluffy. Beat in the eggs, then add the milk and molasses, beating thoroughly. In another bowl, mix together the remaining ingredients and add to the wet mixture, beating until well blended. Pour the batter into the pans and bake for about 30 minutes or until a toothpick inserted in the center comes out clean. Cool in the pans for 5 minutes, then turn out onto a rack. Frost with your favorite cream cheese or buttercream frosting. Also tastes great with maple or caramel frosting, or sift confectioners’ sugar over the top. Place the softened butter in a large bowl. Beat with an electric mixer for 30 to 40 seconds until whipped. Scrape the sides of the bowl. Sift the confectioner’s sugar into the bowl. Beat with an electric mixer for 30 to 40 seconds. Scrape down the sides of the bowl and add the brown sugar and maple syrup. Beat for 2 to 3 minutes or until the mixture is fluffy, scraping the sides of the bowl as needed. Stir in the walnuts until just until mixed and spread on the cooled cake. THE BEST FROM SWANS NEST arrives on May 14th. Pre-order your copy now! It's always a fun day when you have a new book drop. 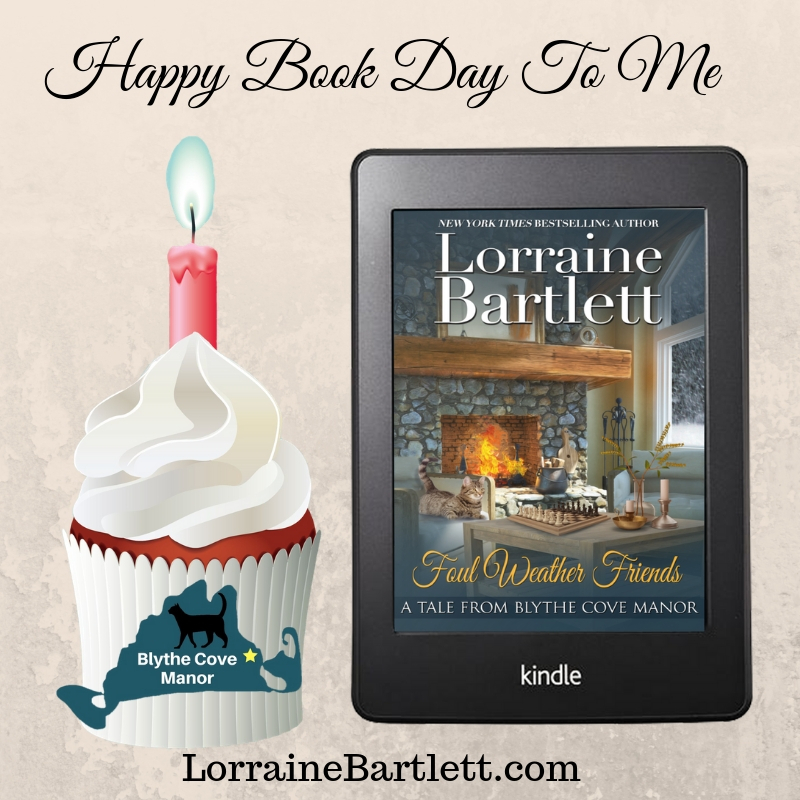 Today, Foul Weather Friends, my 5th Tale From Blythe Cove Manor, is available. Check it out! I like soap. When I was a little girl, my next-door neighbor used to bring back all the little cakes of soap from her business trips and vacations. I was fascinated by all the different wrappings. I had an extra Barbie doll case where I stored all these wonderful little soaps. I also remember swiping a British Rail soap for my collection when I was ... cough cough ... we won't go into how long ago that was. Anyway, I'm still fascinated by soap. I've even considered making it ... but I have so many other things on my plate, I'm leaving that to the experts. I often buy sample sizes because I like the wrapping or the scent. I currently have enough soup to bathe most of Western NY. Part of that is because I have a big glass jar that sits on my bathroom vanity and is filled with Yardley Oatmeal and Almond soaps. (The jar will hold at least ten bars.) My mother told me that the old soap lasts longer than new soap. Is that true? I don't know, but I rotate the soap when the jar is half empty and I stock up. Right now I'm using a sample soap that's got olive oil in it. Stacked up in waiting are soaps that smell like lilac, lemon, and goodness knows what. I stayed in a hotel in Ottawa once that had apricot-scented glycerine soap. Wow -- I liked that a lot. So for a year or two, I bought a bunch of glycerine soaps because they give you nice, soft skin. I bought this little square of black current & olive butter soap last summer and have hesitated to use it. It smells wonderful, but I just love the packaging and don't want to lose it. I had a very nice soap I opened in January that had a nice scent, but I noticed that the more I used it, the less it lathered. So I googled "my soap doesn't lather" and found out that ... for a soap to work, it really doesn't need to lather all that much. Something about dirt and the surface tension ratio of soap to water. It sounded reasonable, but I chucked it because I like more lather than it was giving me. And then there are those foaming soaps. My hairdresser gave me one for Christmas and I like the foam, but the Cherry Chill scent was overpowering for me. I think it will live in my powder room. I like "bar" soaps best. So, what's your favorite soap? What kind of tea sandwiches would you order at Victoria Square's newly reopened tea shop, TEALICIOUS? Make the food myself. I've got a few Indian recipes that I make over and over again, but I've decided I want to do more. I'd like to make at least one new recipe a week. My only real problem is that I usually don't have the ingredients on hand, so this is going to take some planning. It's not so much the spices--I've got them and use them a lot, mostly for breakfasts and lunches (yup, I put curry powder in my omelets--garlic and cumin, too). It's things like plain yogurt and coconut milk. So, in my quest for new-to-me food (and I'm not adverse to eating more vegetarian, either), here's the first recipe I made. And since there are only two of us, it made a HUGE amount of leftovers. In a large pot, add 2 cups of water and place a steamer in the bottom. Return the pot to the stove and add oil over medium heat. Add the onion and garlic and sauté until the onions are tender (3 to 5 minutes) Add the cumin, coriander, curry powder, salt, and pepper. Stir well to combine everything. Add the tomatoes, green peas (if using) and stir in the coconut milk. Bring to a simmer and add the cauliflower back to the pot. Cook everything together for 3 to 5 minutes before serving. Serve over cooked rice. Truthfully, I upped the curry and garlic, and next time I make it, I'll put in some cayenne in for heat. I also opted not to add the peas, but I think I will next time (only I might only put in 1 cup). What new recipe have you made for yourself and/or your family? Would you like to win one of my tote bags and a goody bag filled with bookmarks, postcards, and stickers, too? Well, this is your opportunity! I’m looking to add 200 readers to my newsletter mailing list before April 1st (no fooling)! But please, don’t enter if you plan to unsubscribe the first time I send out a newsletter. I’m looking to add those who actually read my books and/or want to find out what I’m doing in addition to my social media posts. All you have to do is sign up for my newsletter. But wait—there’s a catch. You HAVE to double-opt in. (That means you either get a pop-up to confirm your entry or an email you must click on.) Without that double opt in, your entry won’t count. There will be TEN prizes, so you’ve got a good chance of winning. This contest is for new sign-ups only. About 14 months ago, new neighbors moved in. They had dogs. Rather big dogs. When I was five, I got bitten by a wire fox terrier who was just as big as me when he charged and knocked me down. Since then, I've been wary about "big" dogs. And so our neighbors have these largish dogs. We thought that might be a problem, but it turns out it hasn't. Their yard wasn't fenced when we moved in, and the chain-link fence we had wasn't up to code. Mind you, it was grandfathered in, but since the new neighbors also had children--one of whom was only three, we decided to upgrade our fence. Oooba-dooba -- that was a headache, and incredibly expensive. Even worse, they said they could do the fence in one day. They didn't. So there was our in-ground pool EXPOSED for more than 24 hours and there was a small child next door. (The dogs had been going out on leashes for their outdoor visits.) Finally the fence was in, but the gate was not. I'm a born worrier, so that was another headache. Finally, the gate and fence were finished. And a few weeks later, the neighbors finished off fencing their yard on both sides of the house. Looks very nice. That's when they started letting their dogs loose in the yard, and since then we have had hours of entertainment. These are very quiet dogs. So when we hear them bark, we know they mean business. Usually there's a squirrel (or some other animal) on the other side of the big fence at the back of their yard, which the previous owner put in as a wind break. When we hear them bark, we usually look out the window. Yup--one of them has barked to say, "We're cold! Let us in." Sure enough, a few seconds later, the back door opens and dogs go inside with their tales wagging incredibly fast. Sometimes we see them wrestling in the snow. The other day, I was clearing the driveway and one of them (Lucy) came bounding up to the fence to warn me not to intrude on her territory. I told her, "Good dog!" She kind of blinked and said, "Oh, okay" and then ran back to play with her pack-mate. Next time I get a chance to talk to the neighbors, I'm going to ask if it would be okay for me to give them dog biscuits. I'd like to make friends with them. Meanwhile, here's a picture of one of our new kittens, Poppy. Isn't she adorable? (Um, for some reason she thinks she can help me write. She also likes to sit on my mouse which is uncomfortable for both of us.) It's okay if Mr. L has become a cat person. It really is. Are you a dog or cat (or other animal) person? You can bet that there are Oreos in the cupboard in Tori's kitchen. Kathy, of course, will grudgingly eat one, but she's a cookie baker. There are 41 cookie recipes in The Best From Swans Nest. What's your favorite commercially made cookie and your favorite homemade cookie? Kathy's cookbook THE BEST OF SWANS NEST will be available on May 14th. Pre-order now! The polar cold will be leaving us soon. Just think -- it's only three weeks until the official first day of spring! It was kind of funny. The pet store has no dedicated "meeting room" to get to know cats, so we had to gather in the store's (very clean) bathroom. Kind of like a clandestine drug deal. Of course, they captured our hearts in just about an instant. They were a little younger than we had planned on (but not by much, they're 13 weeks old), and they came home with us. We named them Pippa and Poppy. They were TERRIFIED. Why not? We were two GIANT strangers. The first night, they ran around for about an hour, and we put them in the laundry room (out came the baby gates once again) and decided to let them get acclimated to that room first. They'll be staying there at night for a few weeks until we introduce them to the whole house. Yesterday, they spent the day with us in our connecting offices and it sounded like a herd of elephants were racing around. They have a LOT of energy. And like all teenagers, they are HUNGRY all the time! They didn't get tuckered out until last afternoon. We have a rambling ranch house and we thought we'd let them run around last night, but they were terrified by all that open space. (They really are very little girls.) So back into the laundry room they went, and they were pretty fine about that. Tonight we're going to introduce them to another "confined environment" to see how they do. Foster Mom warned me I might not get much word done with kittens in our offices. But there have been more smiles in this house in the past 36 hours than there have been for eleven months. I'd say that was a pretty good outcome.